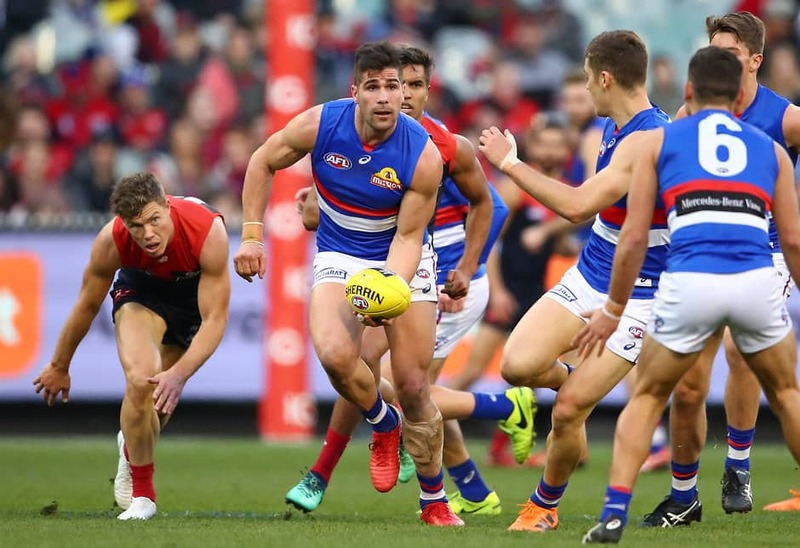 CONTRACTED defender Marcus Adams has officially informed the Western Bulldogs he wants to be traded to Brisbane ahead of Monday's opening of the NAB AFL Trade Period. AFL.com.au understands the 25-year-old notified the Bulldogs over the weekend that he had opted to move to the Lions ahead of interest from Collingwood. With Adams signed at Whitten Oval until the end of 2020, the two parties will need to negotiate a trade, but the Dogs are expected to play hardball in early proceedings this week. Adams' offer from the Lions is believed to be a three-year deal which would tie him to the club until 2021. After an injury-ravaged three years at the Dogs, Adams' decision is based on the need for a fresh start. Brisbane's high performance team is regarded among the best in the League and also played a major role in Geelong's Lincoln McCarthy requesting a move north. Should a trade for Adams be met, his acquisition would be a boost to a Lions defence that includes youngsters Harris Andrews, Darcy Gardiner and Alex Witherden alongside veteran Luke Hodge. With the Lions' pick four touted for Lachie Neale, selections 22 and 40 could be used as part of a deal for Adams. The Magpies held legitimate interest in Adams and met with the West Australian after the Dogs' season ended in early September. With full-back Lynden Dunn expected to be sidelined for the early stages of 2019, the Pies waiting on an answer from Steven May and Darcy Moore's future up in the air at the time, Collingwood planned for defensive contingencies. It now appears Moore is set to re-commit to the Pies, who are also working on a new deal for out-of-contract defender Tom Langdon, whose stocks rose considerably after an impressive finals campaign. It is not the first time Adams has looked to depart the Western Bulldogs. He first asked to be traded from the Dogs back home to Perth at the end of 2016 before re-signing for a further three years in early 2017. Adams was restricted to six games in 2018 in a year disrupted by ankle and shoulder injuries. Taken as a mature-age recruit in the 2015 NAB AFL Draft, Adams has played 27 games in three seasons. Should Adams be released from his contract at Whitten Oval, it would provide further room in the Dogs' salary cap for its pursuit of Port Adelaide star Chad Wingard. Dog Luke Dahlhaus has moved to Geelong, while fellow free agent Jordan Roughead is weighing up interest from West Coast. Clay Smith, Shane Biggs and Jack Redpath have all retired. Now that Greater Western Sydney ruckman Rory Lobb has met with both West Coast and Fremantle, he is closing in on announcing a club of choice for 2019 and beyond. AFL.com.au understands the contracted Lobb is leaning towards selecting Fremantle to play in tandem with youngster Sean Darcy in the Dockers' ruck division. While the Dockers are also working towards a deal to bring Melbourne forward Jesse Hogan home, it is believed they can fit both Lobb and Hogan into their salary cap. Currently holding pick five in the draft, the Dockers could also receive Brisbane's pick four should a deal for Neale be agreed upon. As all 18 club representatives converge on Marvel Stadium on Monday for the beginning of 'official' talks, all eyes will be on the first trade lodged. Among the contenders include Tiger Sam Lloyd's move to Whitten Oval, his former teammates Corey Ellis and Anthony Miles arriving at Gold Coast, Cat Lincoln McCarthy's deal to Brisbane, Aaron Hall's signing at Arden Street and St Kilda's acquisition of Demon Dean Kent. Others to consider include Braydon Preuss (Melbourne), Tyson Stengle (Adelaide), Gary Rohan (Geelong), Kade Kolodjashnij (Melbourne), Nic Newman (North Melbourne), Aaron vandenBerg and Ryan Clarke (Sydney). Bigger deals for Dan Hannebery (St Kilda), Tim Kelly (West Coast), Mitch McGovern (Carlton), Neale (Brisbane) and Jared Polec (North Melbourne) are tipped to take longer into the week. Decisions on where a host of players want to be in 2019 and beyond are still yet to become public. They include Giants Dylan Shiel, Lobb, Will Setterfield and Jeremy Finlayson, Port's Wingard and Karl Amon, Gold Coast's May and Melbourne's Hogan. The official end of the NAB AFL Trade Period will fall at 8.30pm AEST Wednesday 17. With the end of the free agency offer window closing at 5pm Friday, 11 free agents remain unsigned. Alex Fasolo looks bound for Carlton and George Horlin-Smith appears headed for Gold Coast, both expected to be lodged early in the week. Restricted: Jordan Roughead (Western Bulldogs). Unrestricted: Andy Otten (Adelaide), Jarryd Blair, Alex Fasolo, Tyson Goldsack (Collingwood), George Horlin-Smith, Daniel Menzel (Geelong), Taylor Duryea, Ryan Schoenmakers, Brendan Whitecross (Hawthorn), Mark LeCras (West Coast), Tom Liberatore (Western Bulldogs). - Andrew Gaff has knocked back a lucrative seven-year offer from North Melbourne to remain with West Coast. - Gold Coast has until 1.30pm AEST on Monday to decide whether it will match Richmond's offer for Tom Lynch.